Proper acrylic maintenance is important. Anyone who has ever worn them knows just how important caring for acrylic nails is. Sure, acrylics can be something of a lifesaver for those who have a bad habit of biting their nails or who just can't seem to keep their own nails naturally long. But staying on top of them and ensuring that they always look their best is a priority if you want to take advantage of them. Acrylic nails are bonded to the original nail with a mixture of nail glue, acrylic powder and liquid mixture. The nails are shaped with a file, buffed to shine and coated with clear nail polish. 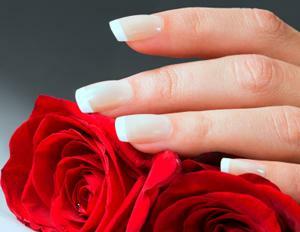 The result is usually a clean, flawless look if you've opted for white tips (or the traditional French manicure). Other options include the slightly tamer American tip, solid colors or vivacious, airbrushed designs. The latter is usually quite a bold choice. Needless to say, such precise application methods from the manicurist demand a bit of maintenance on the wearer's part, too. In order to enjoy those acrylics in their best possible state, the nails must be taken care of on a regular basis. This ensures that they won't be as likely to become loose or chip, either. If that does happen, though, there are remedies to fix the problem. First things first: Treat your acrylics just as you would your real nails. Heed the valuable advice of your nail technician and use the recommended products to maintain their integrity over time. Of course, if you normally bite your real nails, forget about doing that with acrylics - these nails are very strong and rather difficult to chew or bite into. This makes acrylic nails a great solution for the chronic nail biter. Next, understand that wearing acrylic nails also requires some commitment on your part - a bi-weekly commitment, to be exact. Every two weeks, you'll need to go back to the salon and have your nails refilled. Neglecting to do this can result in complete breakage or cracks. In even worse scenarios, water can get trapped beneath the acrylic nail and form a fungus in the warm environment between it and your natural nail. Fillings are essential if only to avoid exposing your nails to various airborne bacteria and moisture. These occur as a result of "lifting," which happens when the acrylic overlay separates from your natural nail plate. This is yet another reason to avoid doing acrylics at home, particularly if you're new to the process. Nothing can take the place of a professional's expert touch. However, not all nail technicians are created equal, so it's crucial to do your research before visiting a salon. Read reviews to ensure that individuals are satisfied with their treatments and haven't dealt with hygiene issues in the salon. As you get your nails filled, you can also have the tips shortened if your nails tend to grow fast (or if you just happen to prefer a shorter fingernail). If your acrylic nail happens to loosen, don't fret. Although routine maintenance of your acrylics will help decrease the likelihood of this happening, there may be the odd occasion when it happens anyway. In that case, the best repair involves removal and replacement. This is crucial because a loose nail is a breeding ground for bacteria to seep through the opening between the overlay and your natural nail. You want to avoid fungal growth at all costs, of course, so it's important to take care of this as soon as you notice it. You may have heard horror stories about women whose nails have been destroyed by trying to remove acrylic nails at home. While it's certainly possible to do, it's usually best to have it done by the nail technician, especially if you're new to acrylics in the first place. Proper removal is an important part of caring for acrylic nails. If you're new to acrylic nails, make sure to care for the skin around your nails, too! Keep a close lookout for redness or peeling, as these can be signs of contact dermatitis, which may result from a reaction to the chemicals used when applying acrylics. If your nails simply don't seem to handle acrylics well, discontinue use and opt for regular manicures instead - these look just as becoming but require far less upkeep!